Our volunteers make real differences in the lives of children and youth. 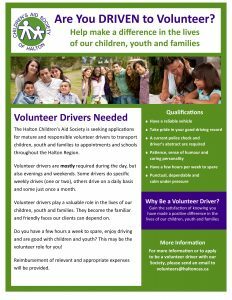 The Halton Children’s Aid Society recognizes community members, parents, teachers and retirees who give their time to enrich the lives of vulnerable children, youth and families. There are so many ways to help. If you have the urge to reach out, we have a volunteer role that’s right for you. Please Note: we are currently recruiting volunteer drivers. To apply for a volunteer position, CLICK here.